← Post Election Blues: So You Want to Move to Canada, Eh? January 17th, 2017 has come and gone and my spouse has a brand, spanking-new mitral heart valve. The days of sodium restrictions have not yet faded, however, thanks to a plucky porcine, he can look forward to many more heart-healthy years. When he was recently diagnosed with atrial fibulation and congestive heart failure, the world as we knew it came crashing down. Sodium restrictions, fluid restrictions, a virtual pharmacy of medications was all foreign territory to our otherwise placid and uneventful lives. However, when it became apparent that surgery to replace his mitral valve was the only viable option, we did a lot of research, guided by our very competent cardio surgeon. We learned that there were essentially two options: a mechanical valve, or a biological valve, composed of either bovine or porcine tissue. It appeared that porcine tissue was the best option and on January 17th, my long-suffering spouse emerged from a lengthy surgery with a fully functioning-functioning mitral valve, thanks to an anonymous pig donor. 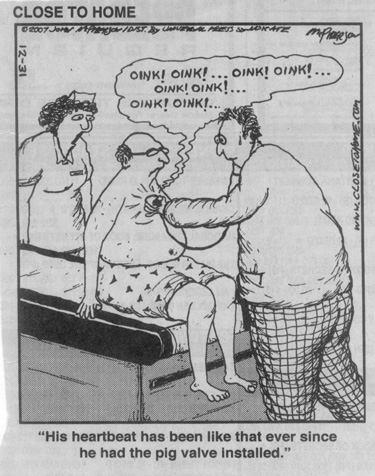 Well, it got me to thinking about that little pig, to whom we pay homage for giving up his little heart valve tissue. There are so many idioms associated with pigs: “pig in a poke”, which is essentially a warning of buying a pig unseen (poke being a sac or a bag). Then, there is “in a pig’s eye”, etc. which supposedly denotes that, when compared to a human eye, a pig eye is relatively small. Of course, there is the story of “The 3 little pigs“ and the infamous “Bay of Pigs”, the location of the 1961 US/Cuban volatile situation with John F. Kennedy and Fidel Castro being significant players. “Sweating like a pig” refers to the moisture which “sweats” out of a pig being cooked on a spit. After coming across so many porcine-related idioms, most of which maligned this very intelligent animal, I researched how significant the little guy has been in human history. In addition to heart valve tissue, I found the following contributions the pigs provide for pioneering research, industry, food and the entire gamut. The list is by no means inclusive: of course, there is food: bacon, ham, pork chops, sausage, ribs, headcheese, chitlins, lard, ice cream, bread, beer, wine, yogurt, cream cheese, whipped cream, energy bars. 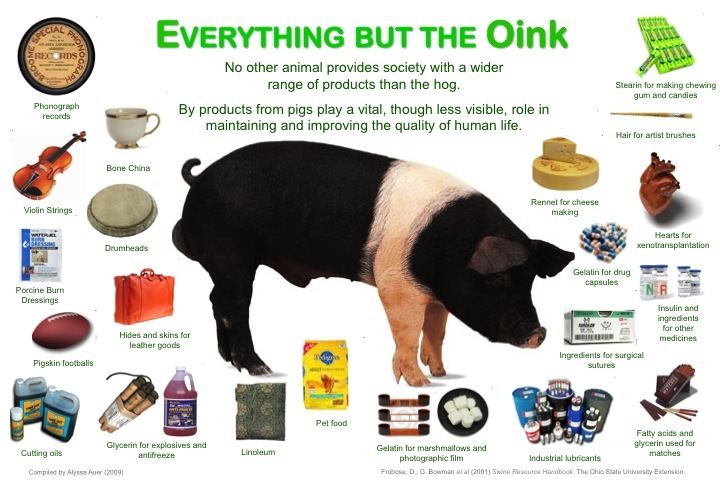 But did you know that pig parts are also harvested and used in the production of insulin, collagen injections, Heparin, multivitamins, toothpaste, medicine tablets, shaving cream, makeup, shampoo, body lotions, soap and moisturizers? Not to mention antifreeze, water filters, insulation, rubber, floor wax, chalk, fertilizers, corks, adhesives, footballs, fabric softener, crayons, tambourines, suede for clothing, bullets, cigarette filters, paints, paper, photographic film, train brakes, shoes, dog treats and other pet foods…the list is endless. In addition, pigs have played an important role in forensic science: the mass, tissue features, etc. 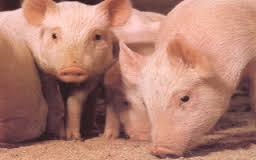 of pigs mimic human anatomy in many ways and are used in studies of bullet trajectories, soft tissue decomposition and more. Thus, our homage to the pig is immeasurable. I recall that, years ago, when I attended the annual Royal Winter Fair in Toronto, I passed by a small enclosure with about a dozen baby piglets, all pink, cute and fuzzy, nuzzling up to their mother. After a few “oh, they’re SO cute”, my gaze fell upon a sign immediately above their enclosure: “Put pork on your fork” and I squealed in disgust. However, I have not eschewed pork since that time, but I have a whole new respect for those plucky porcines, who have given their all (literally!) for humankind. This entry was posted in Cookbooks, Cooking, Eating, Guinness World Records, Menu Planning, New Mexico, Uncategorized and tagged Albuquerque, Canada, cookbooks, Cooking, Guinness World Record, Heart Healthy, Mitral Valve Replacement, New Mexico, Pig Valves, Porcine, Sue Jimenez. Bookmark the permalink. He is doing better, thanks so much! A slow process, but the technology and medical skills of the team were awesome. It has, though, definitely made me much more careful in adjusting my cooking to very low sodium meals. I was always very judicious in using salt, but even so, a little now goes a long way! I hope he is still healing well. I’m glad your husband is feeling better. Can’t say much on pork though as I don’t like the taste.